Our foreign language program is designed to provide an introduction to cultures around the world as students learn different customs and traditions, and we host a school-wide International Day. 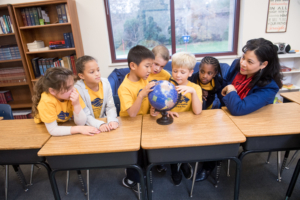 All elementary students study foreign language with a focus on Spanish – as our youngest students are able to proficiently mimic sounds and learn colors, numbers, and a wide variety of introductory vocabulary. Our middle school Spanish curriculum focuses on complex grammar, in-depth vocabulary, conversational speaking, and writing skills. Spanish class often includes games, art, literature, multimedia, and other resources that immerse our students. All middle school students take the National Spanish Exam and graduating students are eligible to earn high school credits for both Spanish 1 and Spanish 2.